“Protec” Carbon Dioxide (CO2) wheel trolley mobile fire extinguishers are manufactured and conformed to BS EN 1866 standard under strict ISO 9001:2008 Quality Management System. Carbon dioxide gas has a cooling effect which extinguishes the fire by directing the jet of CO2 gas to the base of the fire and covering the air around the fire, reducing the oxygen level at the fire point. This will prevent the fire from spreading further and re-igniting again. Carbon Dioxide is tested on class B (flammable liquid) and electrical energised fires and is used as a clean extinguishing agent. 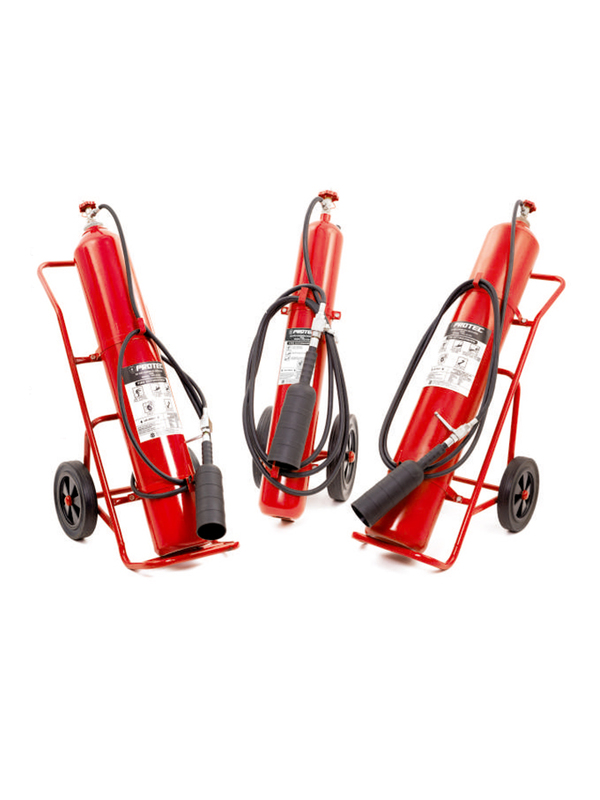 CO2 fire extinguishers are extensively used in electronic factories, ships, electrical and generator plants or rooms. It is a clean extinguishant agent and do not leave any residue after it has been discharged. • CE marked in accordance with the PED. • Safe, reliable and quality assured for long service life. CO2 can burn the skin if the extinguisher is held incorrectly. The gas can also cause suffocation if it has been discharged in an enclosed room. If this happens, it is advisable to seek medical treatment immediately. It is recommended that all personnel should be trained in the operation of the mobile fire extinguisher for their own safety and to maximise the effectiveness of the extinguishing agent.